Cotton Candy Sugar Floss Green Apple. 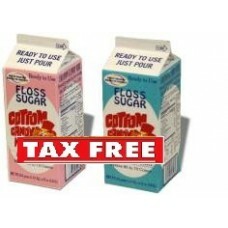 This specially formulated Sugar Floss comes in a 3.25 lb. carton and will make approximately 60 - 70 Cotton Candy Cones or 32 Cotton Candy Bags. This is the same sugar floss used at all fairs, theater and amusement parks. This is already mixed and ready to use, available in 9 popular flavors. Easy pour container.